A Narrative Approach to Level Design. Europa Descent gameplay is broken down into the following key spaces, this modular aspect allows us to work on sections concurrently and have varied gameplay styles for each yet maintain a unified narrative. Each section will be broken up into multiple Dreams depending on engine memory load and story path chosen. Camera: Cinematics with some first and third person elements. This section will be mainly comprised of pre-animated cinematics and background narrative elements. Intractable gameplay will be minimal as these opening scenes are primarily used to set the initial mood and provide historical context for the project. Camera: Third person with limited first person interaction. The surface of Europa is an inhospitable frigid environment filled with a wide range of lethal hazards. With no life-signs the players main combatant will be the environment itself, incorporating moon-quakes shifting ice, crevasses (kilometres deep) and cryo-volcanoes. Once the player descends below the surface they will be presented with a network of caves ranging from cavernous to claustrophobic. 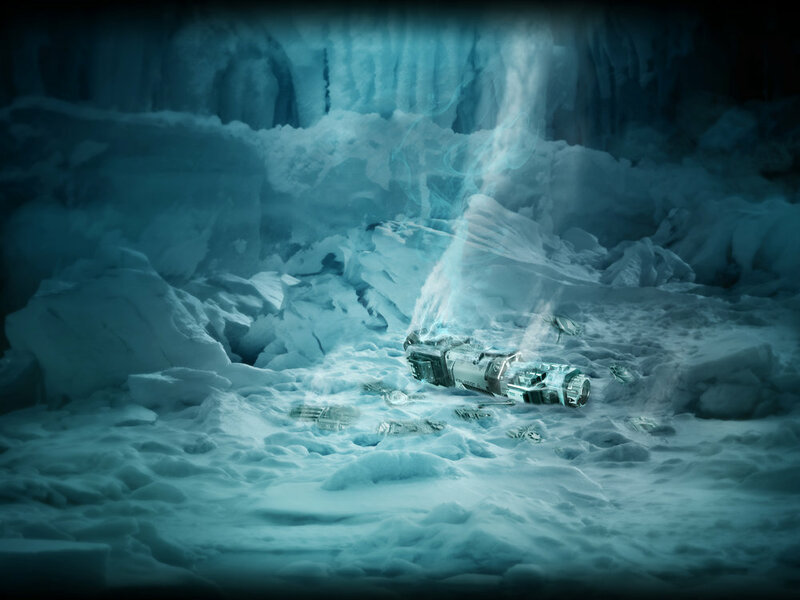 The player will journey deep into the ice shelf using a superheated boring machine that contains a mini sub. Camera: Initally Side-scrolling then third person. Movie Inspiration: 'The Abyss', 'Pandorum' with 'Tron' inspired ship interiors. After exploring the network of subsurface water filled caves your sub enters the oceans below and you will be guided towards a large Alien Mega-structure. The Green section above sees the player exploring around and inside this structure.